Periodical: Hampshire Telegraph and Sussex Chronicle etc. BUFFALO BILL IN A FIX. Saves the Reputations of Heroes. 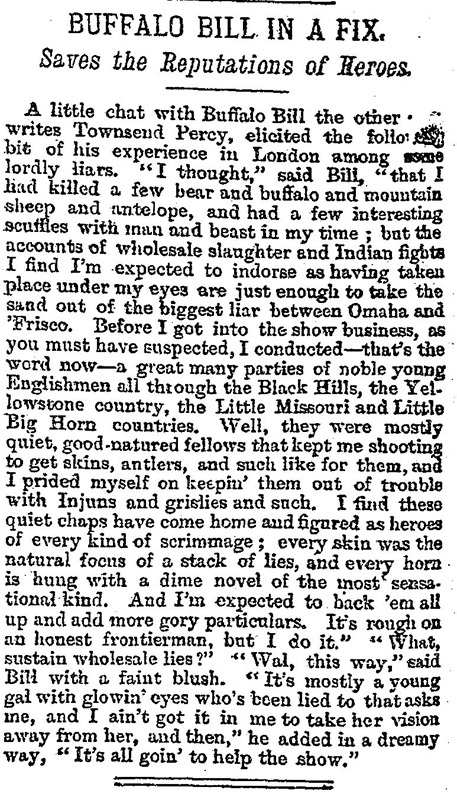 A little chat with Buffalo Bill the other writes Townsend Percy,  elicited the follow [ing] bit of his experience in London among some lordly liars. "I thought," said Bill, "that I had killed a few bear and buffalo and mountain sheep and antelope, and had a few interesting scuffles with man and beast in my time; but the accounts of wholesale slaughter and Indian fights I find I'm expected to indorse as having taken place under my eyes are just enough to take the sand out of the biggest liar between Omaha and 'Frisco. Before I got into the show business, as you must have suspected, I conducted—that's the word now—a great many parties of noble young Englishmen all through the Black Hills, the Yellowstone country, the Little Missouri and Little Big Horn countries. Well, they were mostly quiet, good-natured fellows that kept me shooting to get skins, antlers, and such like for them, and I prided myself on keepin' them out of trouble with Injuns and grislies and such. I find these quiet chaps have come home and figured as heroes of every kind of scrimmage; every skin was the natural focus of a stack of lies, and every horn is hung with a dime novel of the most sensational kind. And I'm expected to back 'em all up and add more gory particulars. It's rough on an honest frontiersman, but I do it." "What, sustain wholesale lies?" "Wal, this way," said Bill with a faint blush. "It's mostly a young gal with glowin' eyes who's been lied to that asks me, and I ain't got it in me to take her vision away from her, and then," he added in a dreamy way, "It's all goin' to help the show."